The growing marine pollution by oil strengthens the interest not only in the methods of combating their causes, but in methods of their forecasting as well on the basis of modeling and calculation of spreading oil spreading on the sea for some reason or other. The paper dwells on a mathematical model of calculating the area of oil spill spreading. The developed methodology for calculating change in the radius and area of oil spill is represented by function of three arguments: oil product density ρ , spillover volume V and o spreading time t.
The proposed model allows forecasting the initial stages of oil spreading. The given methodology enables to determine transit time of the process of oil spill spreading from the first phase to the second one, and from the second to the third one, and the radius and area of oil spill spreading. Considered are inhibitor properties of the tank oil slime. Physical and chemical characteristics of oil and oil slime are given. Given are the data of tests on corrosive stability in atmospheric conditions and by accelerated anticorrosive method. It is shown that the aqueous and organic extract of the tank oil slime has obviously marked inhibitor properties that allow to recommend them for producing anticorrosive paint and varnish coatings. The motion of a ship in long beam seas could be described by a second-order non-linear differential equation, having the roll angle as variable and depending on four parameters. With the direct forcing amplitude as bifurcation parameter, the dynamical system exhibits either periodic or chaotic behaviour, the route to chaos being realized by a period doubling sequence of periodic motions. Some accepted indicators, like bifurcation diagrams, phase planes and Poincare sections have been computed and they confirm the transition from order to chaos. In the main part of the paper, the harmonic balance method is used to obtain approximate solutions for the periodic motions and to predict the period doubling bifurcations by a stability analysis. The development of microelectronics intervened greatly in the automotive industry, therefore this fact cannot be ignored in the education. In today’s teaching absent methods, special classrooms and didactic tool, that allow to know the operating principle, processes understanding and also diagnostics of vehicle electronic systems. The project, which is realising at the University of Žilina intended for the modern education of several study programs is presented in this paper. This project will influence on professional qualifications of project investigators. They will improve their knowledge by means of professional training. New knowledge they will transfer subsequently in the education. The strategic goal of the project is “Reconcile the needs of the knowledge society and the labour market in higher education in the field of automotive technology”. The objective of the present study is to experimentally investigate the thermal comfort inside a car cabin. During the experimental campaign the occupants filled out questionnaires on the thermal sensation vote. The questionnaire contained questions about the local and global state of comfort and were performed according to ISO 14505-3 / 2006 and ISO 10551 / 2001. Each experimental session lasted 30 minutes and each occupant completed four questionnaires as follows: a questionnaire at the entrance in the car cabin, and afterwards one questionnaire every 10 minutes. An internal combustion engine is considered as a material body, which characterized by inertial, elastic and dissipation properties, which are impacted from various forces. Oscillatory motion of a material body occurs in accordance with spectral characteristics of force and frequency responses of the system. The outer surface of the engine generates acoustic energy and causes mechanical noises. The paper dwells on determining acoustic energy in accordance with the acoustical radiation rate if the radiation coefficient of the object observed is known. Also, the sound of the engine is presented as a sum of its separate acoustic powers, and there is determined the acoustic radiation coefficient of the engine for the entire surface, by using the acoustic radiation coefficient of each surface. Simultaneously, there is determined the vibro-energy distribution in the engine design, the assessment of which is made by means of the energy-transfer coefficient, which generates the frequency responses of vibro-acoustic parameters. The paper dwells on peculiarities of operation of engine running on gaseous fuel that envisages the influence of the period of impeding spontaneous combustion on the operation of engine with the dependence on dosing of fuse. Simultaneously, there is considered the influence of changeability of the air-excess coefficient on the engine load when using the different gaseous fuels, as well as its influence on the efficient operation of engine, improvement of ecological and economic parameters, with account for improving geometrical parameters of engine. There are given the analysis and comparison of the efficient characteristics of the ideal cycle of diesel engine when running on liquid and gaseous fuel. As a result of increasing demands for mobility and high consumer expectations of society, the reliability of transport service becomes more modern, necessary and important. The reliability of transport service can be defined as the ratio between the supply (referred to in the schedule) and actually implemented public transport services. The patterns of passengers’ behavior in different situations, such as early arrival or delay of vehicles express the perception of transport service reliability in different manners. This article is a study on the impact of the reliability of transport process on the passenger behavior. The crude oil samples produced from various fields are characterized by wide range of rheological characteristics. On the quantitative indicators of these parameters and, consequently, on the hydraulic resistance of the oil flow movement through the pipeline, significantly depend the possibilities of increasing the pipeline transport carrying capacity. The created physical model enables to determine rheological parameters of crude oil of various types, such as dynamic viscosity and solidification temperature with the dependence on preheating temperature and concentration of specialty solvents. Controlling of objects with the feedback negative loop is widely used in industry, intelligent technologies, robotics and transport systems. A negative feedback loop by comparing of the prescribed value of the output value with measured value of it generates a control signal, which adjusts the output value of the object. Typically, the number of controlled output values is equal to the number of feedback channels acting on the object, but in some cases, the number of the channel can be more. This situation is especially frequent in transportation systems. In the problem of the design of regulators, they pay the most attention to ensuring the required static and dynamic control accuracy, but recently the attention to the conservation of the resource manager increased. This saves fuel or energy costs, which is especially important, for example, in space technology. The task of saving resources in the control of an object with an excess amount of control channels was not previously considered in the literature. In this paper, the problem is investigated by numerical optimization with simulation. In some cases, the cost of resource of the control by the different channels may vary. At the same time the cheaper resources can have the worst quality of the control, for example, it can has a discrete form or (and) less speed and so on. In this paper, we study such state of the problem and give its solution. It is shown that for a suitable choice of the cost function one can preserve rather high quality of the control, while ensuring saving of the controlling resources. Resource saving can reach in some cases 96%, which is illustrated by an example. 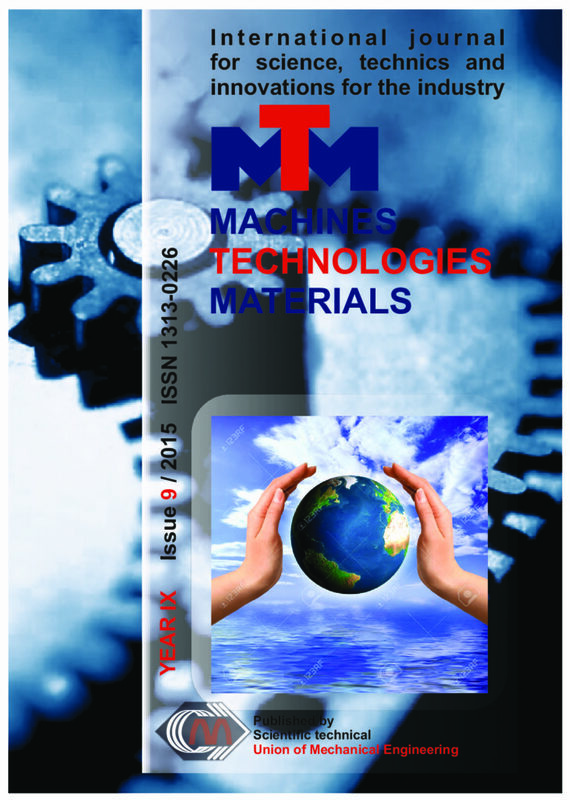 This paper researches the potential use of electromechanical turning mechanism for tracked vehicle. The authors present calculation model for the research, based on the tracked vehicle multipurpose tractor MT-LB. Pros and cons for the diferent types of electrical motors are provided. The main issues are considered in this topic: study of the structure of metro system by using the Graph Theory. New indicators have been defined in the research such as a degree of routing, a connectivity of the route, average length per link (which takes into account the number of routes), intensity of the route, density of the route. The study includes network of Sofia subway and the plans for its future development. The methodology could be used to evaluate other existing metro networks as well as for preliminary analysis in the design of subway systems.